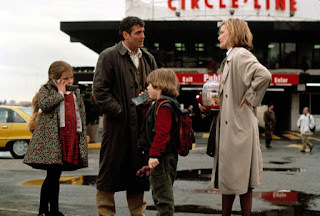 A good quality romantic comedy, One Fine Day enjoys star power in the form of Michelle Pfeiffer and George Clooney, and settles into a pleasant if entirely predictable story of an unlikely romance developing between two stressed single parents. In New York City, businesswoman Melanie Parker (Pfeiffer) is divorced and raising her young son Sammy on her own. Sammy's dad is a rock band drummer who frequently misses family events. Jack Taylor (Clooney) is a popular newspaper columnist, also divorced, and sharing parenting duties for his young daughter Maggie, who is Sammy's classmate. One frantic morning Jack's lack of organization results in both Sammy and Maggie missing the bus and then the boat for a day-long school trip. Jack and Melanie are stuck with their kids on a working day, and Melanie is immediately hostile towards Jack. A further mix-up results in Melanie and Jack switching mobile phones, further complicating their schedules. Eventually they are both forced to agree to trade-off caring for the two children. Melanie tries to prepare for a big presentation at her office despite Sammy's disruptive presence, while the more laid back Jack tries to untangle a big political corruption scandal that may cost him his job, while caring for Maggie and sometimes Sammy. As the day rolls on, Melanie and Jack move from animosity to romance. Directed by Michael Hoffman, One Fine Day is a small notch above standard rom-com fare. Most of the shine comes from the two leading actors lending their considerable charisma to the principal roles. Michelle Pfeiffer and George Clooney both possess high wattage, and they turn on the charm to good effect, allowing the sparks of love to emerge slowly from the mess of a chaotic day spent chasing kids and fulfilling work duties. Pfeiffer is comfortable and assured as an established star, while Clooney is on the cusp of finding his big-screen groove, and together they make for an attractive couple. The film offers one relatively fresh angle by presenting both protagonists as divorced single parents, juggling high-stress careers and child care, their work routines easily thrown into disarray when the kids' plans are disrupted. Melanie and Jack are on an equal social footing, extending to an equivalent level of mutual cynical mistrust due to still-healing scars from failed marriages. The jaded realism adds a welcome wrinkle to the couple's evolving dynamic. Not surprisingly, there is little else in One Fine Day that is even remotely original as the film moves through all the usual gears. The laughs are mild, the kids are cute, the office bosses are crusty, the moments of crisis are never too threatening, the dash to the climax (appropriately, the destination is a kids' soccer pitch) is frantic, and the ending is as preordained as the sun setting at the end of the day. Of course, the locations are scrubbed clean and the music is dreamy. The running time unnecessarily creeps towards two hours, and the film outstays its welcome well after it is apparent that Melanie and Jack will find a way to end their fine day on a positive note. The relatively under-used supporting cast does not help. While the kids (Alex D. Linz and Mae Whitman) are sound and avoid descending into an overdose of cutesiness, Charles Durning as Jack's boss and Amanda Peet as an office vamp get very few scenes to make an impact. One Fine Day delivers exactly what the genre demands in the form of a far-fetched meet-cute come true, with the bonus of luminous leads investing enough talent to tilt the balance towards enjoyment rather than tediousness. Putting together a light romantic comedy isn't rocket science, although you wouldn't know that from the number of failed attempts. But I thought the creators of "One Fine Day" managed the modern elements of the 90's romantic scene quite well. Sure the ending is predictable but I did enjoy the good old-fashioned Tracy - Hepburn chemistry generated by Michelle Pfeiffer and George Clooney.